Vice President of Alumni Relations Lucas Dart, far right, speaks with UNK alumni at a recent social event in Colorado. The events allow graduates to network while also keeping them up to date on university happenings. The University of Nebraska Foundation raised more than $9.5 million to support UNK during the last fiscal year, with 3,100-plus donors contributing. The foundation endowment for UNK has reached about $55 million. KEARNEY – The University of Nebraska at Kearney campus slows down during the summer, when students and faculty slip away to enjoy a much-needed break before fall classes begin. Across town, though, there’s little downtime for the 11 people working inside a small office building at 214 W. 39th St. That’s where the UNK Alumni Association and University of Nebraska Foundation are jointly located. The organizations combined their local operations in 2010 and started sharing office space five years later, allowing them to work hand in hand while engaging Loper alumni, promoting UNK and encouraging philanthropic support for the university. Dart, who graduated from UNK in 1997, has been involved with the foundation and alumni association in various roles since 2002, serving as UNK’s vice president of alumni relations and development the past four years, a position that also leads campus fundraising efforts. The entire staff feels this way. They spend their time planning and hosting alumni events, connecting with UNK graduates through social media and the UNK Today semiannual magazine and working with donors to fulfill their visions. The foundation also raises money for specific projects on campus, such as the artificial turf replacement at Ron and Carol Cope Stadium, and the alumni association is a resource for faculty looking to bring successful graduates back to campus to speak or mentor current students. UNK Chancellor Doug Kristensen said the integrated foundation/alumni association office is a model for the rest of the university system that focuses on both fundraising and friend-raising. 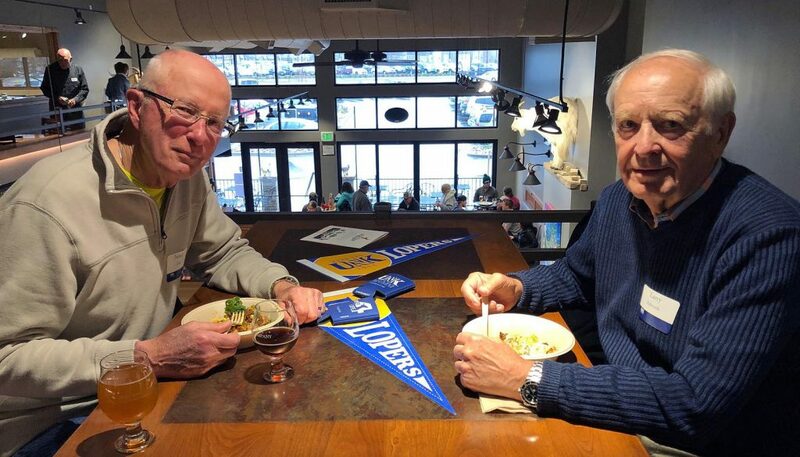 UNK alumni Patrick Carr, left, and Larry Edwards socialize at a UNK alumni event in Colorado. There are roughly 54,000 UNK graduates living across the globe, with about 70 percent of them residing in Nebraska. In Kearney, approximately 1 in 8 residents has a degree from UNK. There are roughly 54,000 UNK graduates living across the globe, with about 70 percent of them residing in Nebraska. In Kearney, approximately 1 in 8 residents has a degree from UNK. “That’s a big influence,” said Dart. 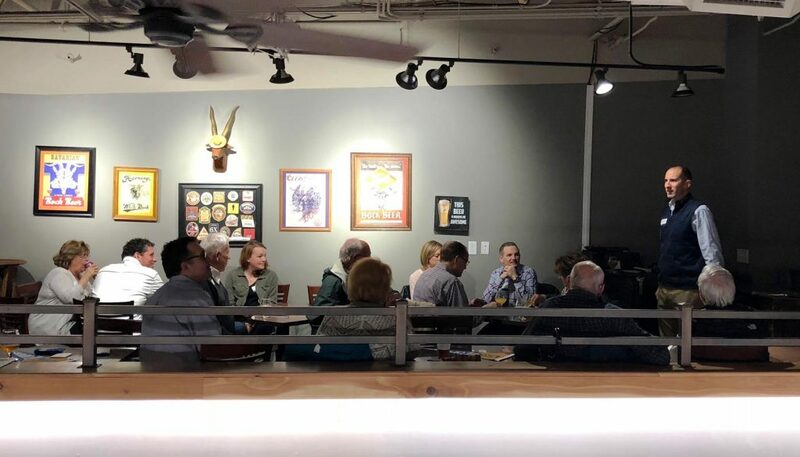 The alumni association hosts quarterly social events in Kearney that allow graduates to network while also keeping them up to date on university happenings. Kristensen, head men’s basketball coach Kevin Lofton and some of the Loper players spoke during the April gathering. These events aren’t fundraisers, but there’s definitely value for UNK. “The more informed people are about what’s going on at the university, the better equipped they are to help us recruit students and engage their unique networks on our behalf,” Dart said. The goal is to build school spirit among lifelong Lopers, no matter where they live. Alumni events are held regularly in cities across the state, from Omaha and Lincoln to North Platte and Scottsbluff, as well as places such as Kansas City, Colorado, Des Moines, Iowa, Southern California and Arizona. “We go where the people are,” Dart said. The summer schedule included a poolside gathering in Pueblo, Colorado, golf outing in Omaha and social hour at a Walt Disney World resort in Florida. A golf tournament raising money for UNK student scholarships will be held Aug. 31 at Ashland Golf Club. The association also organizes events during homecoming week, coordinates a women’s mentoring program that pairs successful alumni with undergraduates and hands out annual awards recognizing outstanding seniors and distinguished alumni. 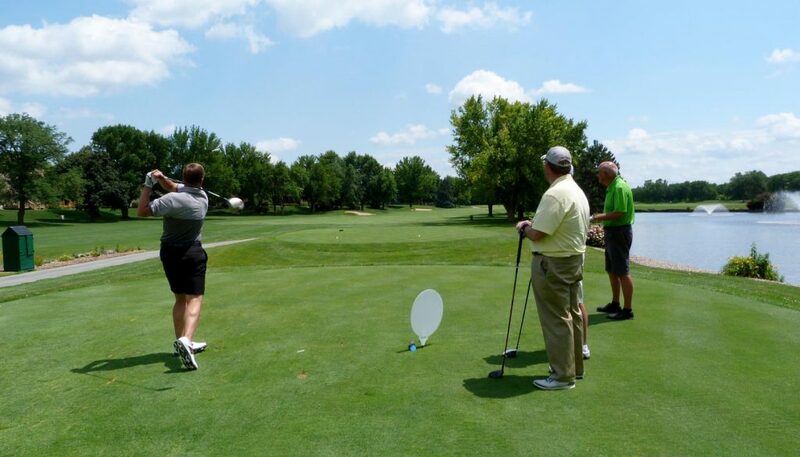 The UNK Alumni Association hosts a golf tournament each year to raise money for student scholarships. This summer’s event is Aug. 31 at Ashland Golf Club. There are a variety of reasons people give back to UNK, but they all have one thing in common. “Most people give because they want to see students have an opportunity,” said Kristensen. The University of Nebraska Foundation helps make that happen. The nonprofit organization raised more than $9.5 million to support UNK during the last fiscal year, with 3,100-plus donors contributing, and the foundation endowment for UNK has reached about $55 million. Most donations are restricted to a specific purpose, with a majority of the dollars supporting student scholarships. “That’s such an important part of the University of Nebraska at Kearney,” Dart said. Scholarships make college affordable for many families – 45 percent of UNK students are first-generation attendees and 70 percent of undergraduates receive scholarships or grants – and merit-based awards are used to recruit the high-level students a university needs to excel. Nearly $2 million in scholarships supported by the University of Nebraska Foundation were awarded to UNK students in 2016-17. Recipients are selected by the scholarship committee of the UNK Office of Financial Aid and individual colleges. “Honestly, I think some people would call us the UNK Scholarship Foundation,” Dart said, referencing the organization’s impact in that area. UNK receives financial support from alumni, community members, organizations and many others who understand the value of higher education and the university’s contributions to the state. They give money because they see the potential for an even greater UNK that will educate and transform future generations. Foundation staff members become trusted partners, working with donors to identify their priorities and passions and helping them turn a vision into a reality. “In a way, the foundation makes dreams come true,” Kristensen said. The University of Nebraska Foundation secures private donations to enhance instruction, research, Loper athletic programs and buildings, opening the door for opportunities beyond what’s supported by state and tuition dollars. 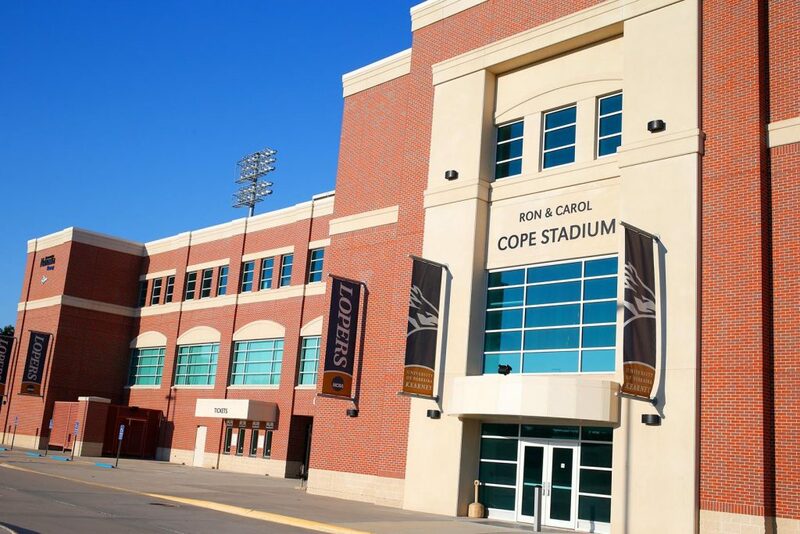 Ron and Carol Cope Stadium is among many projects on campus that have benefited from private donations. In addition to providing scholarships, the foundation encourages private investment to enhance instruction, research, Loper athletic programs and buildings, opening the door for opportunities beyond what’s supported by state and tuition dollars. There are plenty of examples that highlight the impact. Private contributions partially funded the Health Science Education Complex shared by UNK and the University of Nebraska Medical Center and a financial gift from LaVonne Kopecky Plambeck of Omaha allows UNK to improve the Early Childhood Education Center named in her honor. That gift also includes an endowed professorship in Montessori education and endowed excellence fund for early childhood programs. The LaVonne Kopecky Plambeck Early Childhood Education Center is expected to open in fall 2019 in the University Village development south of UNK’s West Center and the Health Science Education Complex. Ron and Carol Cope, the late Kearney couple who donated millions of dollars to UNK, are recognized across campus for their contributions. You’ll find their names on the stadium, fountain and Nebraska Safety Center, as well as a professorship fund, student leadership program, scholarships and the Ron and Carol Cope Cornerstone of Excellence Award, the highest campus honor. Dart sees the potential for foundation fundraising to enhance the 80,000-square-foot STEM building that’s slated to open in fall 2019 by adding more state-of-the-art lab equipment, and the organization will be heavily involved as the University Village development begins taking shape. Plans for that project, which covers 104 acres just south of U.S. Highway 30, include an indoor/outdoor tennis facility that would be paid for entirely with donations and an engagement and alumni center that would serve as the new home of the UNK Alumni Association and University of Nebraska Foundation, along with other nonprofits. There’s a good chance the group working inside that office building across town will make these visions a reality, too. Need another example of how private contributors to the University of Nebraska Foundation are benefiting UNK? The foundation has undertaken two major comprehensive campaigns since UNK joined the university system in 1991. The first, which extended from 1993 to 2000, raised about $10 million for UNK. The second, which ran from 2005 to 2014, led to $61.2 million in financial commitments to UNK. Lucas Dart, vice president of alumni relations and development at UNK, attributes this increase to a couple of factors. First, he said, people understand the important role the university system plays in Nebraska. It’s an economic driver and the path to future success for thousands of residents. Greg Daake never lost the connection to his alma mater. The York native graduated from the University of Nebraska at Kearney in 1996 with a Bachelor of Fine Arts degree in visual communication and design. His wife Lisa earned a bachelor’s degree in business administration and human resource management from UNK the previous year. Today, they run Daake, an Omaha-based design and marketing company that provides branding and creative services to clients across the country. 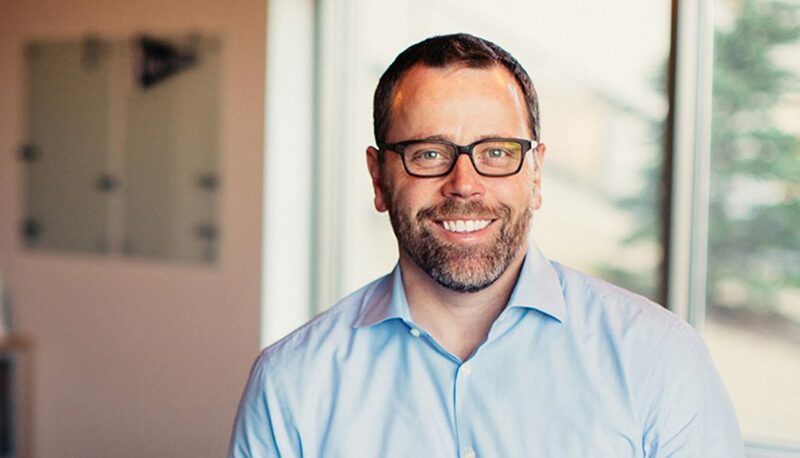 Greg is principal and creative director of the company he founded in 2001 and Lisa serves as vice president. This professional success, Greg said, is tied to the knowledge and experience he gained at UNK, and he wants other students to have the same opportunity. The couple established the Daake Design Scholarship Fund in 2009 to ensure this happens. The permanently endowed scholarship covers the annual tuition for a UNK student pursuing a degree in visual communication and design. Greg, who speaks regularly to students at UNK, understands the value of academic scholarships, particularly for a major with extra expenses for supplies and tools. As a University of Nebraska Foundation trustee, he sees firsthand the impact private contributions have on scholarships and student support. The connection to his alma mater also provides some professional perks. Daake has a history of hiring UNK students as interns, the latest being senior Jase Hueser, and several full-time employees graduated from the university. “There is kind of a UNK DNA here,” Greg said. The University of Nebraska at Kearney has been a big part of John Lakey’s life. 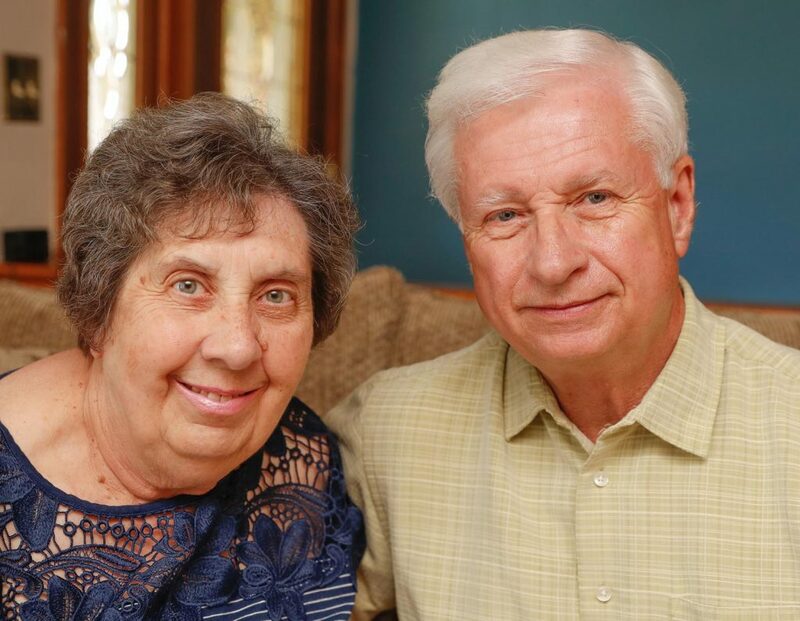 Lakey and his wife Deanna both graduated from UNK, as did two of their children, and he spent 36 years working for the university before retiring in 2013 as assistant vice chancellor for business and finance. The Kearney couple have numerous friends at UNK and they’re regulars at Loper athletic events as season ticket holders. “We have a lot of connections to UNK,” said Lakey, who used to volunteer at Loper track meets. That’s why they enjoy giving back to UNK through donations to the University of Nebraska Foundation. The Lakeys support student-athletes by donating to the athletic programs and they also contribute to various academic departments and scholarships. Lakey appreciates the emphasis on academics that shows up in student-athletes’ grade-point averages. As a former assistant vice chancellor for business and finance, he also understands the important role private contributions play in providing opportunities for UNK students. “We know that tuition and state funding don’t take care of all the needs, so it’s important to have that support from the foundation,” Lakey said. Erica Chu received a scholarship through the Office of Multicultural Affairs (OMA) while attending the University of Nebraska at Kearney. 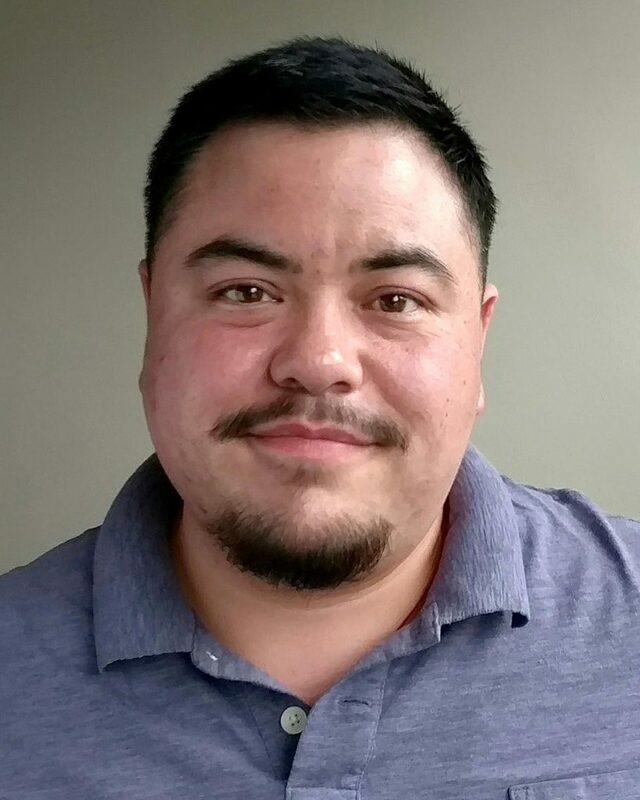 Chu, who earned a bachelor’s degree in English from UNK in 2006, hasn’t forgotten that financial support or the positive experience of connecting with people from different backgrounds. “It was a really transformational time,” Chu said. Chu, who holds a master’s degree from Loyola University Chicago and is currently pursuing a doctorate there, donates to the UNK Office of Multicultural Affairs Alumni Inspired Scholarship and Fellowship Fund. This scholarship is awarded to students who are members of the OMA student organization and demonstrate strong leadership skills. “I want to give back because I received a lot of benefits during my time there,” said Chu, who is also a visiting lecturer at the University of Illinois at Chicago. 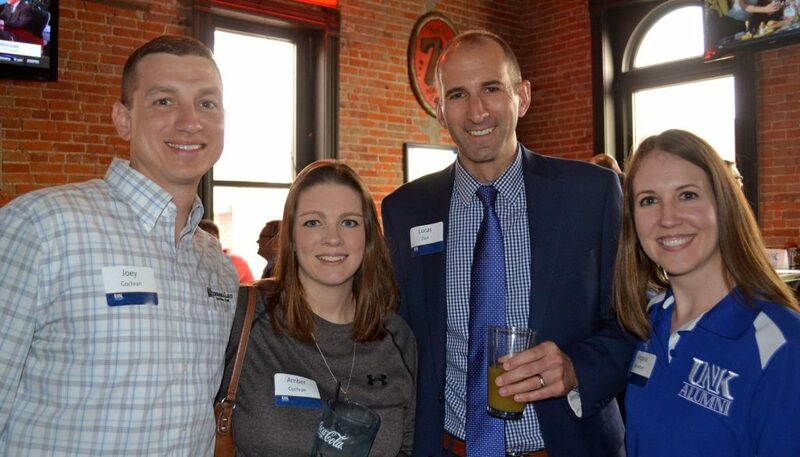 Vice President of Alumni Relations Lucas Dart, third from left, meets with UNK alumni, from left, Joey Cochran, Amber Cochran and Angela Davidson at a Kearney Quarterly event at Cunningham’s Journal.